Huzzah, Reese Witherspoon! The Oscar-winner got a standing ovation for her speech accepting her award as a Glamour magazine Woman of the Year—and the applause didn’t just come from the folks attending the ceremony at Carnegie Hall on November 9th. Witherspoon’s speech, at once a tribute to female ambition and a call to arms for women in Hollywood to demand bigger, better roles, went viral after she delivered it, and inspired cheers all over the world. It’s no wonder that Witherspoon has excelled at playing go-getters such as Tracy Flick and Elle Woods and seekers like Cheryl Strayed, the author she portrayed in last year’s widely praised Wild: Witherspoon is herself a person with the courage to strike out on her own, as she’s proved by setting up her own production company focused on female-driven stories. As she said in her speech: She does not like to be underestimated. Mr. Valentino certainly has never underestimated Reese. The two first got to know each other when Witherspoon was still a starlet: She wore Valentino to the Golden Globes in 2000, the first year she was a nominee for its Best Actress award. Two years later, she’d make an indelible impact on the Oscars red carpet wearing another Valentino look, a Deco-esque beaded gown in black. There have been other Valentino outings for Witherspoon over the years, including social ones. 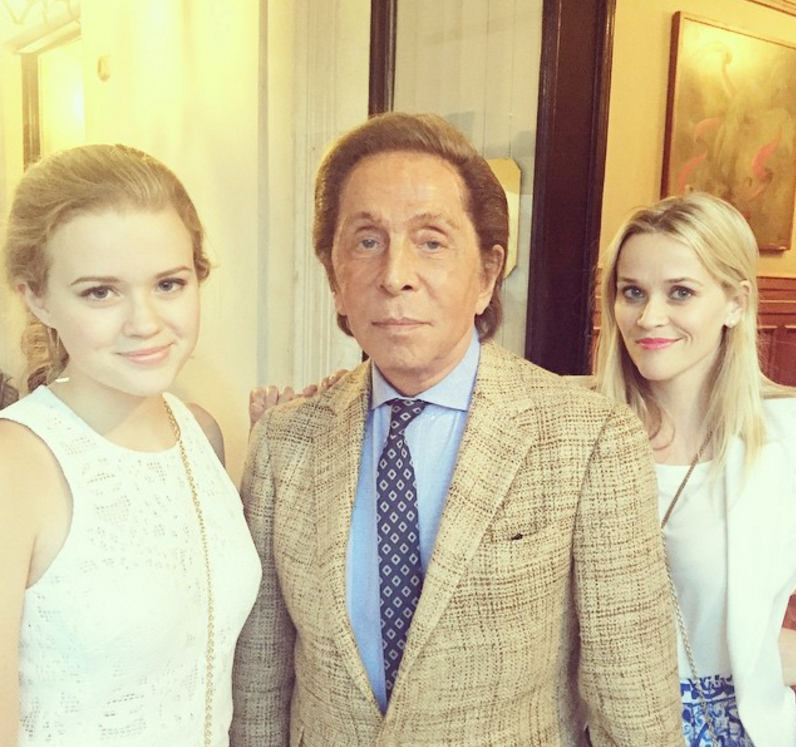 Most recently, she and her lookalike 15 year-old daughter Ava Phillippe paid a visit to Mr. Valentino when they went on holiday to Italy. “What an honor to see Mr. Valentino at dinner last night in Rome,” Witherspoon wrote on her Instagram, captioning a photo of herself, her daughter, and the designer who’s so memorably clothed her since she became a star. “@maisonvalentino #legend.” A good Southern girl to the last, Witherspoon hasn’t forgotten her manners. She doesn’t just get cheers. When they’re due, she gives them, too.